We've all done it. With one bite of a truly perfect pastry, we've closed our eyes and sighed an almost sensual "Mmm!" Light and flaky, crisp and golden, good pastry just melts in your mouth. However, pastry has been proclaimed as one of the most difficult dessert elements to make. That's because most cooks don't understand the importance of one key ingredient: Cold. Cold what? Everything! For perfect piecrusts and pastry shells, culinary school instructors teach that your butter or shortening, your hands and your pastry blender should all be cold. In fact, your water should be icy. Why? Because if you allow your dough to become too warm, the gluten (a protein in the dough) will fully activate. If that happens, your pastry won't keep its shape. It will stretch out too much when you form it then shrink horribly when it is baked. In one Portland culinary school, students are taught the art and science of working with pastry. Cooking school teachers put their focus on working with the dough quickly and gently and - of course - keeping the entire recipe as cold as possible. For a basic pastry recipe that could be used for piecrusts and the like, cooking school students start with flour and cold butter or shortening that has been cut into cubes. Next, they add salt and baking powder, which will produce the leavening factor, allowing the pastry to rise. With a pastry blender or two table knives, the fat is cut into the flour mixture all the while being as gentle as they can while keeping the temperature low. Using their hands, they gently combine ice water with the dry ingredients until the mixture forms a ball. The ball is then separated into three sections, covered with clear plastic wrap and refrigerated for at least one hour, so the dough can rest before continuing. 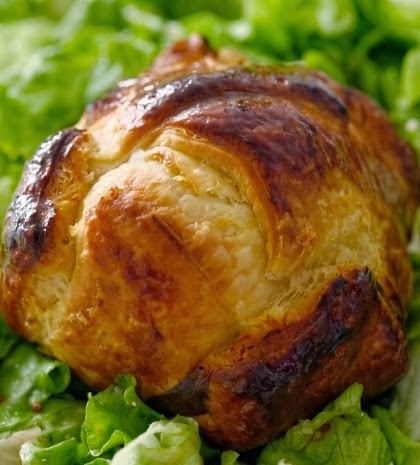 Oh so delicate and tender, puff pastry is most commonly used in tarts or turnovers. The difference in puff pastry and basic pastry, as culinary school instructors will tell you, is not the ingredients. It's the preparation. As with the basic pastry recipe most cooking school students learn, the ingredients and initial processes are practically the same. The puff pastry, however, includes more butter than basic pastry. For this reason it is especially important to work with cold ingredients and hands. In addition, you may opt to use a chilled marble board to help keep the butter from getting too soft. Once the pastry has rested in the refrigerator for one hour, the dough is rolled out into a rectangle shape then folded into thirds. This process is repeated six times to greatly enhance the flakiness and the height of the pastry. It is now ready to shape, bake and fill with everything from creamy chicken a la king to rich chocolate mousse. Remember the tips culinary school experts teach: Avoid touching the dough as much as possible; always keep your hands, utensils and ingredients cold; and allow the dough to rest before baking. You'll find making the perfect pastry gets easier with every recipe. Mike Churchill provides online marketing support for Western Culinary Institute. Cooking school applications are currently being accepted. If you have a love of cooking and are in Portland, culinary school could be your next step. Visit us at http://www.wci.edu.